Last night the 20th annual British Arrows Craft Awards brought together the industry’s finest to celebrate the very best in advertising craft from the past year. For twenty years the awards have helped champion and award the innovation, bravery and artistry of those who craft moving images in advertising, making the awards show one of the most eagerly anticipated of the year. The Mill is thrilled to have been nominated across the VFX, CGI, Animation, VR and Colour categories and to have scooped up four awards on the night. 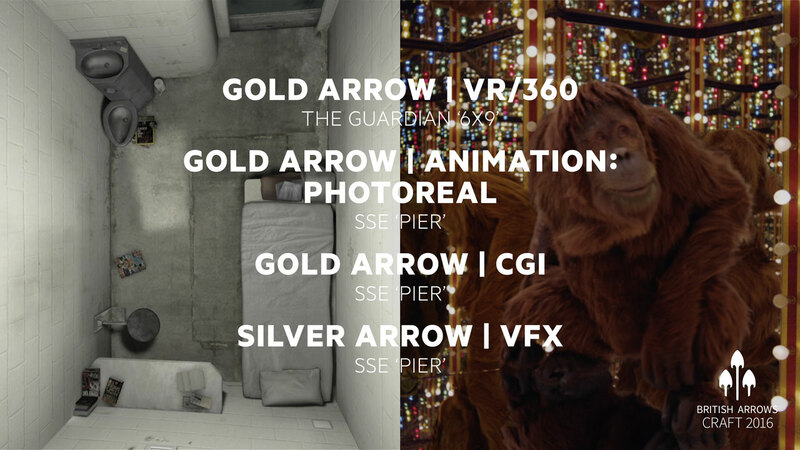 SSE ‘Pier’ picked up a Gold for both Animation and CGI as well as a Silver in VFX, rounding off an amazing year of accolades for the project created by adam&eveDDB and Director Frederic Planchon out of Academy. In addition, this year marked the introduction of a new award to recognize the growing importance of VR/360. The first ever Gold in this category was awarded to The Guardian ‘6x9’ experience, a creative collaboration between The Guardian and The Mill. It was an honour to see so much of the work The Mill has been a part of being recognised - Lloyds ‘For your Next Steps’ for In-Camera Effects; Hennessy ‘The Piccards’ for Cinematography and Colour; Curry’s ‘Spare the Act’ for Best Performance by an Actor; and Save the Children ‘Still the Most Shocking Second a Day’ for Editing, Performance by an Actress and Sound Design. Congratulations to all the night’s winners. To view all shortlisted and winning work visit the British Arrows Craft website.